The District Plan is now available online. The E-Plan makes it easy to look up the zoning of your property and the rules that apply such as the distance from your garage to the property boundary, fencing rules, and what activities are permitted on your property. To use the new plan online, type in your property address. To view the applicable District Plan rules once your property appears, choose the 'Show District Plan for' tab. You can also search the 'Search provisions' bar at the top to look for particular topics in the District Plan. 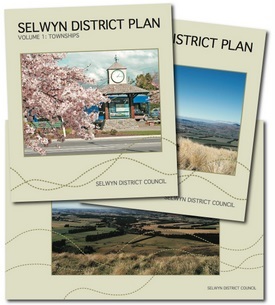 The new format plan replaces the hard copy of the Selwyn District Plan. The paper version of the District Plan was around 1,500 pages in total. The electronic version of the plan makes it easier to find sections applicable to different properties and includes hyperlinks so people can easily refer to other sections referenced in the District Plan. Our District Plan was made fully operative on 3 May 2016. The District Plan is regularly updated due to Council Plan Changes, Designation requests, Private Plan Changes and fixing minor errors or omissions. Changes to the Plan have been listed separately for easy identification for updating your manual copy of the District Plan.